April | 2017 | Schott, P.C. The Federal Circuit held that a party that had been assigned a parent patent lacked standing to sue for child patents issued from the parent patent. The assignment in question did not assign rights related to continuations, technical know how, or general IP rights. Equity aids the vigilant, not those who slumber on their rights. This is a legal maxim that speaks to fairness, and in the courts, the maxim finds its roots in the equitable defense of laches. Laches differs from a statute of limitations, which applies to particular situations. The Supreme Court recently addressed the distinction between laches and statutes of limitations in patent cases. Its 7-1 SCA Hygeine Products AKT vs. First Quality Products, LLC (S. Ct. 2017) considered whether laches could be used as a defense by defendant First Quality when 7 years had passed from when it first received notice of potential infringement in 2003 and the date that SCA filed an infringement complaint in 2010. Returning to the maxim, the question before the Court was whether SCA slumbered on its rights by not bringing suit until 7 years after it knew of First Quality Products’ potential infringement. Considering this Congress-passed statute for damages recovery and the laches defense, the Court followed its 2014 Petrella decision in a similar case under copyright law, “Laches is a gap-filling doctrine, and where there is a statute of limitations, there is no gap to fill.” It went on to point out that there is not “a single federal statute that provides such dual protection against untimely claims.” It bolstered its reasoning with guidance from some older case law: Holmberg v. Armbrecht, 327 U. S. 392, 395 (1946) (“If Congress explicitly puts a limit upon the time for enforcing a right which it created, there is an end of the matter”); United States v. Mack, 295 U. S. 480, 489 (1935) (“Laches within the term of the statute of limitations is no defense at law”); Wehrman v. Conklin, 155 U. S. 314, 326 (1894). 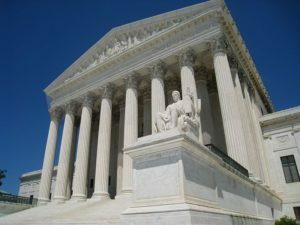 It reached its conclusion that “Laches cannot be interposed as a defense against damages where the infringement occurred within the period prescribed by §286” in spite of Justice Breyer’s warning that the decision may set up this scenario. [A] patentee might wait for a decade or more while the infringer (who perhaps does not know or believe he is an infringer) invests heavily in the development of the infringing product (of which the patentee’s invention could be only a small component), while evidence that the infringer might use to, say, show the patent is invalid disappears with time. Then, if the product is a success, the patentee can bring his lawsuit, hoping to collect a significant recovery. And if business-related circumstances make it difficult or impossible for the infringer to abandon its use of the patented invention (i.e., if the infringer is “locked in”), then the patentee can keep bringing lawsuits, say, in year 10 (collecting damages from years 4 through 10), in year 16 (collecting damages from years 10 through 16), and in year 20 (collecting any remaining damages). The possibility of this type of outcome reveals a “gap.” Laches works to fill the gap by barring recovery when the patentee unreasonably and prejudicially delays suit. Justice Breyer’s warning may be prescient and something to watch for in coming years.